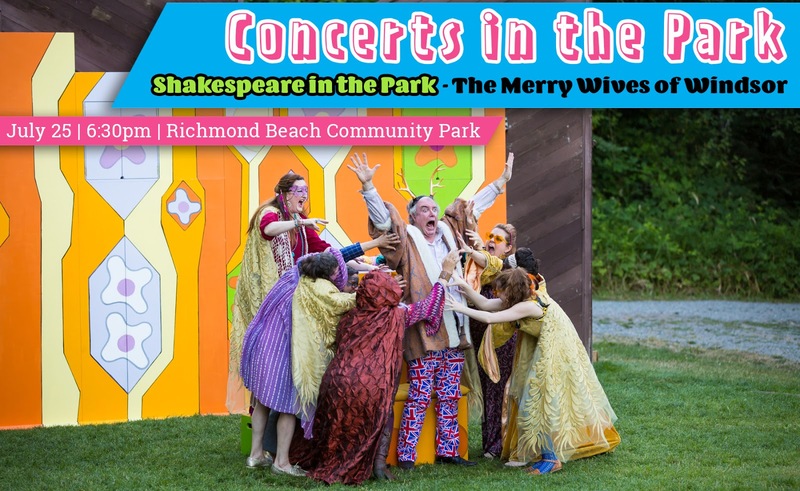 Gather your family and friends, pack a picnic and a blanket or low chair, and come enjoy a free performance of The Merry Wives of Windsor by Seattle Shakespeare Company and Wooden O Productions at 6:30pm on Wednesday, July 25 at Richmond Beach Community Park. On the make in the sleepy suburb of Windsor, the fat knight John Falstaff hopes to score a pretty penny by seducing two of the town’s wealthy wives, Mistress Page and Mistress Ford. Performed by Seattle Shakespeare Co’s Wooden O Productions, this production is directed by Corey McDaniel and, of course, written by William Shakespeare. Plus, wet your whistle during the show at the free “Hydration Station,” organized by Concerts in the Park presenting sponsor, Aegis Living of Shoreline. The Shoreline-Lake Forest Park Arts Council’s Concerts in the Park are always free and held at various community parks throughout Shoreline and Lake Forest Park on Wednesdays in July and August at 6:30pm, rain or shine. Concerts in the Park is supported by the City of Shoreline, City of Lake Forest Park, 4Culture, Aegis Living of Shoreline, Jack Malek of Windermere, and by Arts Council members and donors. Add this event to your calendar on Facebook for a helpful reminder!